Hello Blog World!! I am so happy to be back! 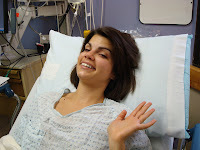 My surgery went perfectly, although they did discover that I have arthritis at the age of 24, but other than that all is fine. I am now in my recovery stage. 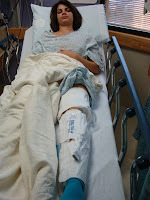 Today was the first day, in three weeks, that I was allowed to take my stiff-leg brace off. And boy does it feel good to bend (slighty) my knee! As with todays' TWD, I feel like I am rising again, on my way back to my full potential. It's gonna take some time to be completely 100%, but like a good Kugelhopf (chosen by Yolanda of the All-purpose Girl), it's all about the waiting process! I don't think there couldn't have been a better chosen recipe to represent these last few weeks for me! I must admit, I was a little nervous about making this recipe, not only because it had been a few weeks since I have even looked at my mixer, but also because of the dreaded word Y-E-A-S-T. As you may remember from the TWD Sticky Buns I was very apprehensive about a yeast recipe, because all of my previous attempts with yeast had failed. But I tell you, there's something about Dorie's recipes that always seem to work out. I now have two successful yeast baked recipes under my belt, and am slowly starting to warm up to the bubbly, fermenting little guy! I wanted to switch up my Kugelhopf, maing it a little more suited for the fall season that has hit New Mexico like a shcokwave. So, I opted to used dried cranberries and white chocolate chips. And boy what a match. The sweet/tartness of the cranberries gave the perfect zing the the airy, buttery dough, and the scattered bite of white chocolate was a sweet, melty surprise. And who says you need a traditional Kugelhopf pan? I made half the dough in my Brooche molds, and the other half in a tube pan, and they worked perfectly. I can't wait to make this recipe again, but try different additions! Glad you are on the mend! 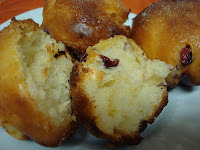 Great job with your kugelhopf! Yum - cranberries! 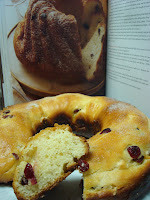 Your kugelhopf looks great! Glad you're feeling better and "rising" to the occassion ;) I was tempted to add white chocolate chips to mine too. I totally should have listened to my gut b/c it definitely needed something. Glad you enjoyed the recipe! So glad you are on the mend. Nice work on the kugelhopf! Oh dear, I feel for you! 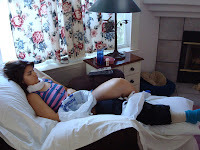 I dislocated my knee in August and was in full leg cast for 6 weeks, it was awful! Good on you for getting up and baking, I love your flavor combo! Welcome back! I'm glad your on the mend. 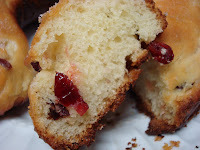 Your kugelhopf looks great. YUM! a symbolic choice for you this week! cheers to you for making the recipe, and i hope you're up and running around soon! Wow Gret Job! Kugehopf looks amazing hope you enjoyed the treat.